iRelief 2 is a revolutionary healthcare product that relieves pain fast. 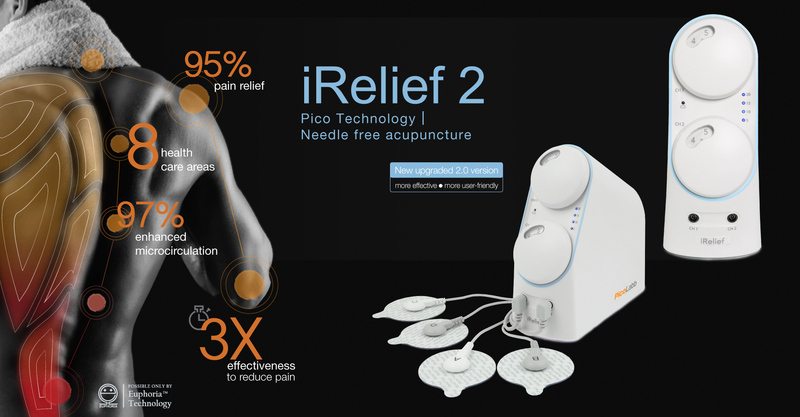 It sends an electric current to acupoints through tailor designed iRelief Pads with IPC’s proprietary Pico Technology. It is more user friendly than needle acupuncture because the Pads provide an entire pad diameter of effect which allows user to accurately target the acupoints. Regular use of iRelief 2 will improve the following eight health care areas. The design of iRelief 2 is based on the advanced and reliable IPC’s proprietary Pico Technology and the application of the Chinese Meridian methodology. iRelief 2 increases Adenosine Triphosphate (ATP) production, enhances body microcirculation and strengthens the immune system, so the body’s innate healing potential will be maximized to optimize body recovery and ultimately promote health. iRelief 2 can treat 4 acupoints at the same time, and its portable design lets you self-administer healing anywhere, anytime wherever you are at home, work or travelling. Many people have been benefited by iRelief 2 for pain relief and getting better health. To make the devices easy to use, we created the iRelief Pads and provide the Wisdom Book for you. Put iRelief Pads on the area of pain or the acupoints as illustrated in the book for your specific need, it is that simple to stay healthy even you have no knowledge of acupuncture. The Wisdom Book guides you for best use of iRelief Pads for the pain caused by poor microcirculation. It has 170 pages to cover nearly 50 treatment suggestions for many kinds of pain and common illness. Smart iRelief Pads target the acupoints automatically and accurately. The iRelief 2 is three times stronger than iRelief. iRelief 2 effectively relieves most symptomatic pain in 10 minutes. For long term pain or chronic diseases, the relief cycle may take more time. The iRelief devices can relieve various kinds of pain and common illness including: headaches, neck and shoulder pain, back pain, knee pain, arthritis, muscle aches, insomnia, menstrual pain, constipation, indigestion, common cold and flu, cough, diabetes, gout, hypertension, allergies and other chronic conditions. iRelief 2 is remarkable needleless acupuncture device, that combines Traditional Chinese Acupuncture, Chinese QiGong and modern physiotherapy with many years of research and clinical support. The thoery of Chinese medicine says: Wherever there is blockage of Qi, there is pain. When Qi flows properly, pain disappears. Meaning the blocked meridian flow or impeded microcirculation will manifest into pain or illness. The modern technology helps us to visualize the effect of Qi in real time. The thermographic imaging measures the change of body temperature. The infrared images show the effect (on the right) after using iRelief. The enhanced microcirculation, hence rise in skin temperature, is a sign that the body is under increasing biochemical reactions for body recovery. Poor microcirculation manifest into pain or illness. The application of iRelief result in faster and stronger microcirculation that maximizes body's own healing potential for better health. + Watch the microcirculation change with the use of iRelief for 20 minutes. iRelief 2 uses an optimized biological waveform that is perfected over the years and is most suitable for our body recovery, the result effectively enhances the microcirculation which helps to improve pain relief, sub-health conditions, immunity disorders, common women's & men's health problems; and for the purposes of beauty and illness prevention. The iRelief 2 is designed to be simple for you to operate. You will find the devices with one touch on/off button, precise turntable intensity control and 20 minutes auto off timer with LED light to keep track of the progress for each treatment. To adjust the output intensity for your need. Intensity is shown in numbers for precision. You can self-administer healing anywhere, anytime with the built-in rechargeable battery. The iRelief & iRelief Pro have been used by over 10,000 users of various ethnicities and age groups. iRelief 2 will get even more popular. The book helps you for the best use of iRelief 2 to restore health, relieve pain and prevent illness. iRelief 2 is enabled by Pico Technology.